I was reading Karl-Heinz Frieser's Blitzkrieg Legend, about the Fall of France, and his section on the initial German offensive through the Ardennes region inspired me. I had never played an operational scale game based on the Battle of France, and the operation as Frieser described seemed like it would make for an interesting scenario in the Command Ops engine. Inspired by the ease by which sweeteye is pumping out his scenarios, I decided to give it a shot as well. It wasn't easy, but after about 2.5 months, I'm almost finished. 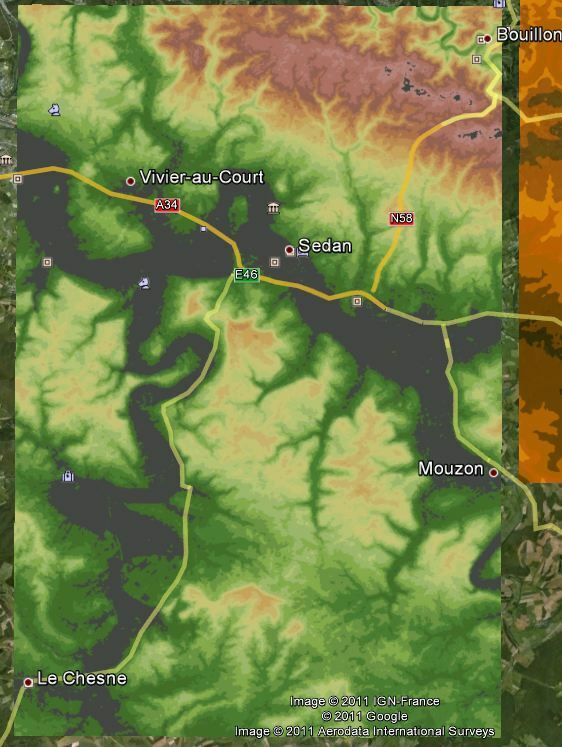 I decided to map out the area from just west of the Luxembourg border to just east of the Sedan River (Bouillon is just 1.5KM from the map edge). This makes for a 56kmx36km wide map that just comes in under the upper limit in the map editor. 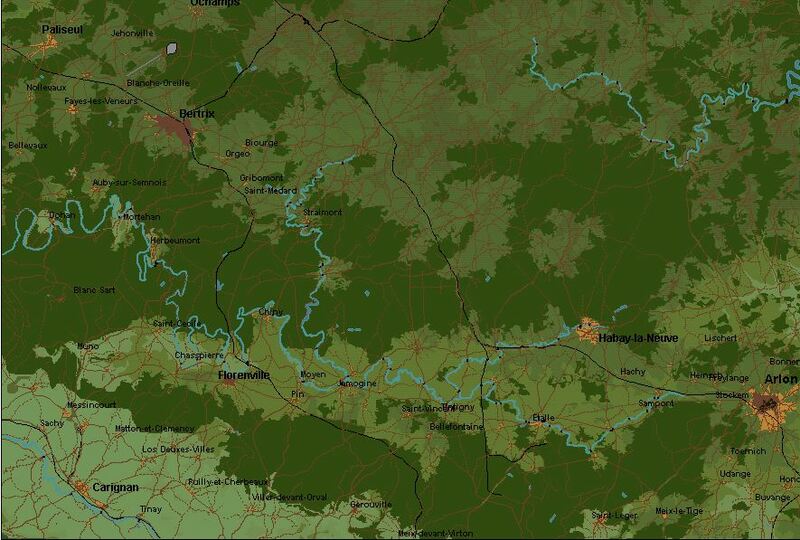 I used DRM data for the topography, and Google Maps for the roads, forests, rivers and such. I could not find a suitable period map, so unfortunately the map isn't exactly historical. Enough typing, now for some pictures. The whole shebang. All hills, roads, rivers, forests, etc are mapped in. The only part I need to finish right now is placing the actual cities. There's a whole lot of them! I'm using a custom texture set that is a mashup of someone else's work from CotA and some of my own work. One thing that is apparent is that the section of the Ardennes the Germans moved through isn't as heavily forested as is sometimes believed. Plenty of major roads to move west on. Habay, Arlon and their surrounding suburbs. 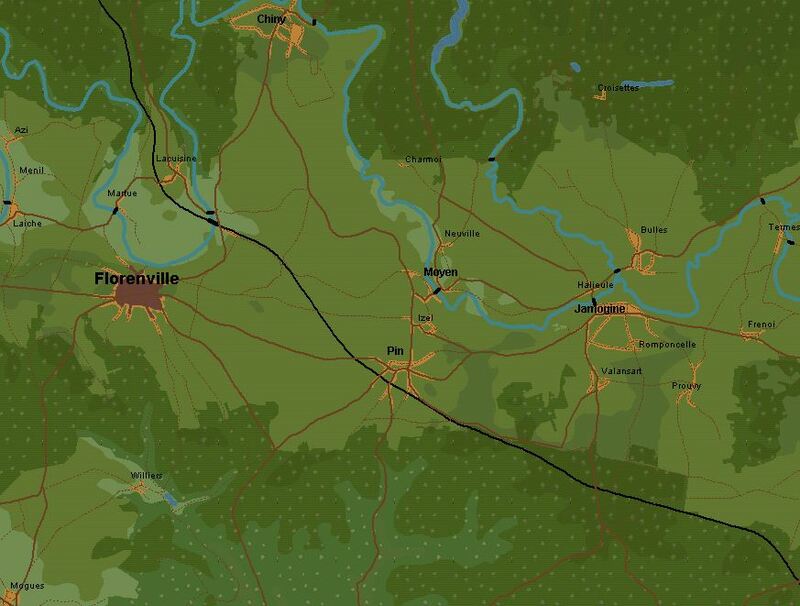 Florenville, surrounding villages and the minor river that bisects most of the map. They've really packed the villages in tight over the years! Status: offline Beautiful map. Hope you do finish! Bon courage! A France 1940 set of scenrios would be interestinmg. The German passage through the western Ardenne and then the crossing at Sedan were very much a close run thing. Things could have gone horibly wrong for the Germans if the Allies had got their act together. So there should be plenty of scope for some really good what if battles. You are going to need to work up a fair number of 1940 Estabs so you can re-create the forces. Perhaps others could help you with this. Status: offline Thanks for the comments everyone! Yes, right from the start I was hoping to do some alternate history scenarios with this map. The book I mentioned also describes some French counter attacks shortly after the crossing of the Sedan, that should actually be fairly interesting as historical scenarios. Would be interesting to see what a competent human player (or AI) could do with the forces the Allies had. And yeah, I don't even know where to start with the Estab stuff. I'm thinking that once I'm done with the map, I'll just throw together some fictional scenario with the current estabs, in order to be able to actually play on the map before sometime next year. And then start working on some real 1940's estabs. Of course I'm always open to help from others! Status: offline I've had a crack at a (1941 Vichy) French OOB, in the scenario linked to below. From what i remember reading the only difference in TO&E between 39/40 & 41 was that a newer rifle was more widespread, and perhaps the grenade launcher the opposite, i think. Lieste made some comments about the estab at the bottom of the first page, which haven't been rectified. Status: offline Thanks for the link Chief, I'll take a look! I believe that a forum member who posts as Franklin Nimitz was working on an OOB for France 1940, but I haven't noticed him hanging around here in a while. You might want to PM him and let him know what you are up to. He might be able to help. Status: offline I found an excellent OOB (divided into a "North-Eastern Theater of Operations" [TONE] and a "South-Eastern" TO [TOSE]), which is somewhat like the German System in Russia (with "Heeresgruppe Nord" etc. = ie. Army Group North, Center, South). The OOB then breaks it down to the Regiment level, with invidually/additionally attached companies, like engineers for example, or even transport companies [horse-drawn or motorized]). The 9th motorized (Inf) Division. "25% du personnel en permission", which means that 25% of its personnel was on leave (when Germany attacked). There are more detailed and useful infos like those (here and there), but gathering infos about (and understanding the composition of) these French units surely slows down your progress (assembling a realistic estab). Since COTA did not offer an estab editor, and after 2 forum members started to work on one or another France/Holland 1940 scenario (what happened to those ones, btw? ), I dumped the idea, so I just bookmarked it, but I never saved the info. If you think this OOB is useful, you might want to save all the webpages for further offline use, as these have been online for a loooong time already (signature says they were created with Netscape composer, lol), so I wouldn't be surprised if they'd just disappear one of these days. I do not know if they're accurate, and it may be a bit cumbersome (in case your French isn't the best) to get the hang out of the naming conventions and the composition of the different units, but the author put quite some effort into this OOB/TOE, for sure. Status: offline Btw, nice map ! 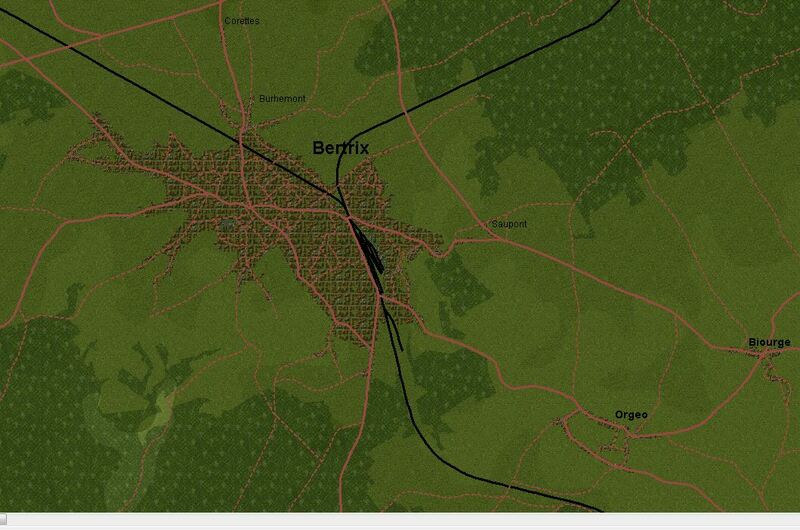 Status: offline I'm working on some scenarios set on Holland 1940, in which the French will also feature. I've already done some work on the French Estabs. If you're interested, let me know by e-mail or PM and I could send them to you. Status: offline Thanks for the links everyone, I appreciate it! 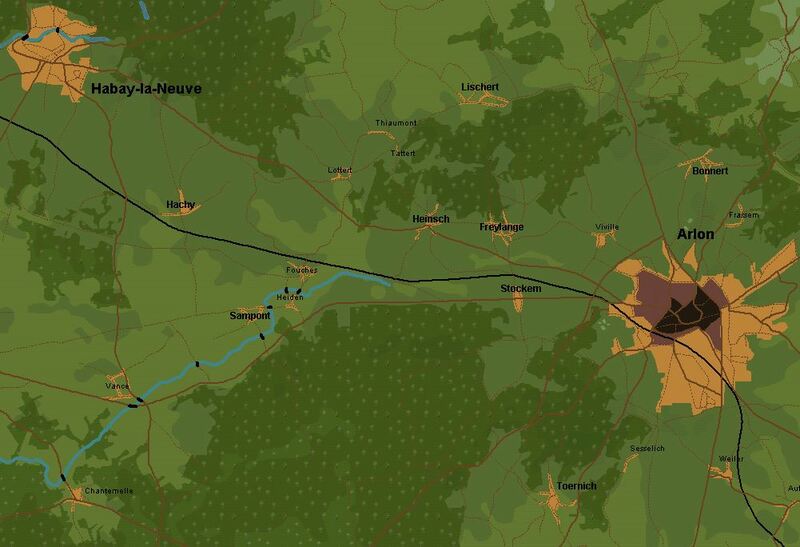 The book I mentioned has a map anda limited ORBATof French deployments in the Ardennes during the battle, but its very high level and these links are helping me get down into the weeds of what the force structure should look like. And I might have to borrow that estab from you, tukker, as I'm having a hard time getting French company level TOEs! I decided to go ahead and start my estab from scratch, using the info I found here: http://www.atf40.fr/ATF40/. This site is pure gold, entirely in French but gives a breakdown of the different French units, with headcounts and even the amount of trucks and types and what platoon and section they were found in. Truly a great resource. Progress is slow (I decided to try to get down into the real nitty-gritty details, for example modeling most of the major trucks the French army using their real stats, which is surprisingly hard to find! ), but I've finished the French Cavalry Division, which was the main unit defending the Ardennes. Hopefully things will go faster now that most of the major equipment is in the estab now. When you need a new weapon type, a 25mm ATG for instance, do you start with a preexisting weapon, a 57mm ATG for instance, and then modify the values as needed to develop the new type? When you create a new unit type, the 25mm ATG Coy for instance, do you start with a preexisting unit from the stock estabs, a 57mm ATG Coy for instance, and then modify the values as needed to develop the unit? Put another way, are you doing all this from scratch, or building on what comes with the game? Status: offline I do a mixture of both. For vehicles and weapons, I have a lot of the major data (penetration, speed, etc) but am often missing hard data on other stuff (accuracy at range, fuel consumption). I'll often look at other weapons in the estab and use that data. Take the 25mm ATG for example. I have penetration data for that, but am missing accuracy information. What I did was look at the 37mm Pak 36, which according to my readings was virtually identical in terms of performance to the 25mm ATG, and used the accuracy data from that weapon to help round out the information. I do similar things with other items if I'm missing information. For new units, I rely on the currently established units for reference on certain characteristics, like how fast should a base deploy, what's the KPH of a Division HQ unit, what are fuel loads like, etc. The units themselves in terms of personnel and equipment come completely from my sources, however. So, I'm essentially doing both. Status: offline Sounds great . I do a mixture of both. For vehicles and weapons, I have a lot of the major data (penetration, speed, etc) but am often missing hard data on other stuff (accuracy at range, fuel consumption). I'll often look at other weapons in the estab and use that data. Take the 25mm ATG for example. I have penetration data for that, but am missing accuracy information. What I did was look at the 37mm Pak 36, which according to my readings was virtually identical in terms of performance to the 25mm ATG, and used the accuracy data from that weapon to help round out the information. I do similar things with other items if I'm missing information. CMBO and CMAK database tables - I can't remember the name of the gentle soul that compiled them - could help you a lot figuring out a few of the vehicle/gun parameters. Please let us know how your mod is working out with the patch. Status: offline That map is a work of art. It looks like it's textured to either look like cloth or textured paper. Whatever the effect it looks superb. Unfortunately I'm not very close to getting units on the map and scenario hammered out... new estabs takes a long time! That map is a work of art. It looks like it's textured to either look like cloth or textured paper. Whatever the effect it looks superb. Thank you! All it is is a little noise added through Gimp... It breaks up the plain colors and adds a little texture to it. Took a while until I was happy with the effect and the colors. Status: offline Yeh you have to go lightly when adding noise texture to map tiles as too much makes it nigh impossible to read the text overlay. Status: offline hey,...is thre meanwhile a date when this szneario will be finished?